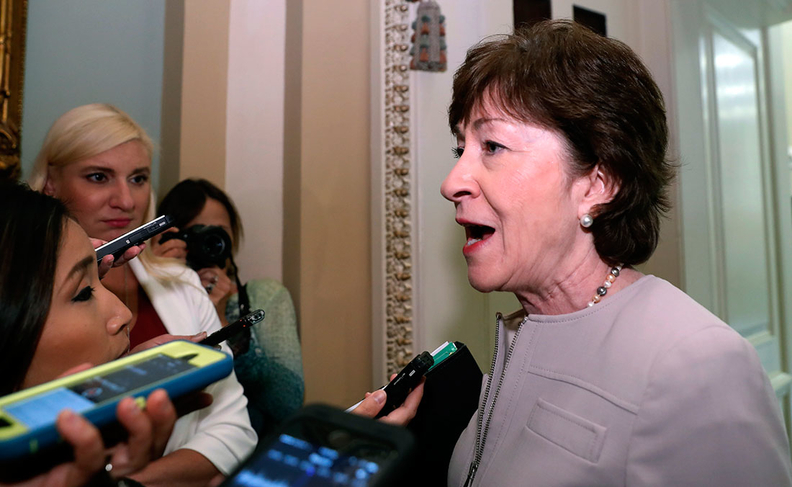 Sen. Susan Collins' pact with Senate Majority Leader Mitch McConnell (R-Ky.) came undone early Wednesday afternoon. The Maine Republican wanted to include cost-sharing reduction payments and a reinsurance fund to shore up the individual market in the end-of-year spending bill Congress has to pass before Friday at midnight to avert a government shutdown. Collins authored the reinsurance bill with Democratic Sen. Bill Nelson of Florida. The CSR funding was hammered out by Sens. Lamar Alexander (R-Tenn.) and Patty Murray (D-Wash.). The measures had strong support from insurers who just watched Congress vote to repeal the individual mandate, considered a core element of the Affordable Care Act. Repeal of the mandate was included in the massive tax overhaul that is now on its way to President Donald Trump for his signature. With House Republicans holding steadfast in their opposition to including market stabilization provisions in the spending bill, Collins and Alexander conceded defeat, at least for now. "Rather than considering a broad year-end funding agreement as we expected, it has become clear that Congress will only be able to pass another short-term extension to prevent a government shutdown and to continue a few essential programs," Alexander and Collins said in a joint statement. "For this reason, we have asked Senator McConnell not to offer this week our legislation" as part of the spending package. Democrats, who initially supported the Alexander-Murray bill as a block, lost their will to push for it as open enrollment came and went and insurers locked in 2018 rates that include the CSRs. Collins and Alexander emphasized that they believe McConnell will bring their legislation to the floor in 2018. "It looks like the Christmas present of lower health insurance premiums will now have to be a Valentine's Day present," Alexander said. Meanwhile, talks continue over exactly what will be included in the end-of-year package, and staff and lawmakers say they don't know what to expect in the final Senate-House deal.